If you are not being automatically enrolled into your workplace pension scheme, but would like to participate in the scheme, you will be able to opt in (provided you are age 16-74). To opt in through your member portal, you need to go to Account in the top right-hand corner and select Manage Membership from the drop-down box. The following page will then appear. You can opt in by clicking the button that says I wish to opt in. This will produce the pop-up box shown below. At this stage you will be requested to confirm that you wish to opt in/ join by typing in the exact required words 'I wish to opt in'. 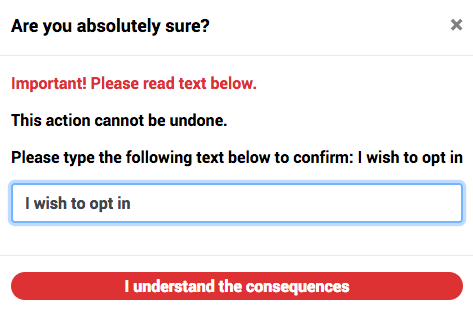 Lastly, click on the red button that reads I understand the consequences to complete the process. That's it! Welcome to Smart Pension!